When it comes to building a garden wall, the only limitation is your imagination. 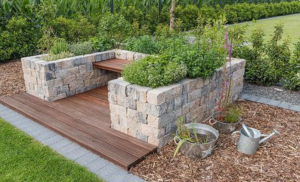 Garden walls serve only a couple of purposes, to look aesthetically pleasing to the eye of the homeowner and to serve as a barrier or attractive border around flowerbeds, trees and gardens. They are usually not designed as retaining structures for holding back soil or stabilizing a slope or uneven ground. The variations of garden walls with regard to shape, color, size and design are completely at your discretion. To help you create the garden of your dreams, here are some general ideas for garden walls and your next yard project. Flowerbed are probably the most common settings for garden walls. The shapes, contours and designs are limitless. 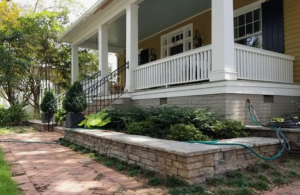 You may want a place for your rose bushes, hydrangea, azalea or daffodils… Or maybe you have some bushes and shrubs that you want contained to create both a natural boundary and seamless integration with your house or yard. Imagine having a flower garden arranged in color coordinated layers or sections (shades of one favorite color or all the colors of the rainbow). Garden walls can also be used to organize plants and flowers symmetrically or with intentional randomness. And for the overachievers, consider a garden wall as the border for a mini Japanese garden. You can build garden wall flowerbeds in limited sections or outline the entire border of your yard or house… Dream it up, and create the flowerbed you always envisioned. A garden wall adds a beautiful flourish to your front-of-house flora and foliage. You could plant herbs in little pots by your kitchen sink… but isn’t this savory “secret” garden nook so much more fun? A tree is a tree is a tree… except when it isn’t. Level up! 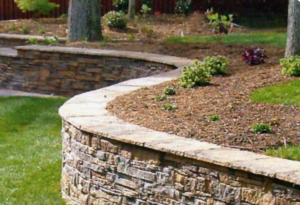 Try a garden wall to add a new dimension to your yard. For those enthusiasts with a green thumb, a wall around your garden is a sure way to impress visitors but also provide a distinct, clean and sharp look for your garden. It also adds your own personal touch… and might even keep the pesky critters out! As an added benefit, the boundary may also serve as a border, which can help with mulching and weeding (every gardener’s favorite task). You may also consider using a wall for your herb garden. Garden walls around trees or bushes might be the simplest type. The easiest styles are those built with bricks and circular in nature. But who wants easy? You can use any particular shape that you might, like such as square or oval. But the border of the wall is the just beginning. Consider the filler… Some people use rocks, gravel, dirt or mulch to fill the inside of the wall around a tree for that added personal touch. People also consider walling off two or more trees, or even an entire row of them, depending on the size and shape of the property. A garden wall around a tree, or several of them, provides a creative design to an entire yard.